Get ready for the Witcher's weirdest adventure yet. 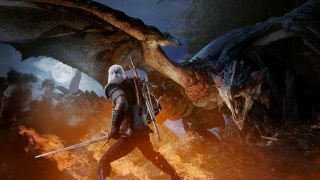 Geralt of Rivia may be the Witcher, but his job description has always been monster hunter, which makes his upcoming appearance in Monster Hunter: World perhaps the game’s most sensible crossover event yet. Capcom has announced the collaboration event will kick off on PC May 9, and it’ll feature new quests and Witchery gear to earn. The Witcher/Monster Hunter crossover is perhaps the most involved mash-up Capcom has created to date. Geralt of Rivia himself appears in the New World, with brand-new gravelly Geralt lines performed by the actors from the original games. Using Geralt’s silver sword, you’ll have to hunt down a Leshen, which you may remember as an antlered forest abomination from The Witcher III: Wild Hunt. The new special assignment is called Contract: Trouble in the Ancient Forest, and it features several possible endings that depend on the choices you make throughout the quest chain. Finishing the quest provides a bunch of Witcher-themed Monster Hunter goodies, plus materials for crafting a set of Geralt’s armor a sword and shield set based on his trademark silver monster-hunting blade. Oh, and you can craft a Nekker outfit for your Palico. You’ll need to be Hunter Rank 16 to take on the first new quest, which means you’ll need to have finished the story campaign. Don’t worry if you haven’t gotten around to doing that yet, though—unlike most of the other special events in Monster Hunter: World, this new Witcher quest will be available permanently. Events like these are typically split into two phases, and this is no exception. Starting May 17, the second half of the crossover opens up, which centers on a multiplayer hunting event for the much more powerful Ancient Leshen. That quest will be available to players at Hunter Rank 50 or higher. More details are available over on Steam.